It started out as a side thing, but then it just took off, says Kristina Klein, founder of EATology, an unusual bus depot diner in Vernon. It’s modern, but funky, with wooden floors instead of scuffed lino. It still features the chrome chairs, pedestal tables and high-backed booths you’d see in a 1950s diner at the local bus depot. “There’s lots of love in it,” Kristina explains with a grin. 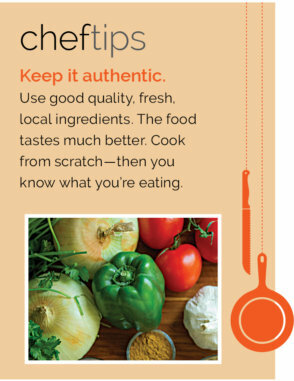 “All the sauces, dips, dressings and soups are made from scratch. I love food. My grandmother and dad were amazing cooks,” she adds. Growing up in Oliver, her Ukrainian parents owned a restaurant, so even as a youngster, she helped out — even if that just involved peeling a potato or two, she recalls. That early beginning led to work in the food industry in Australia and in Europe, where she took some lessons in preparing local dishes. 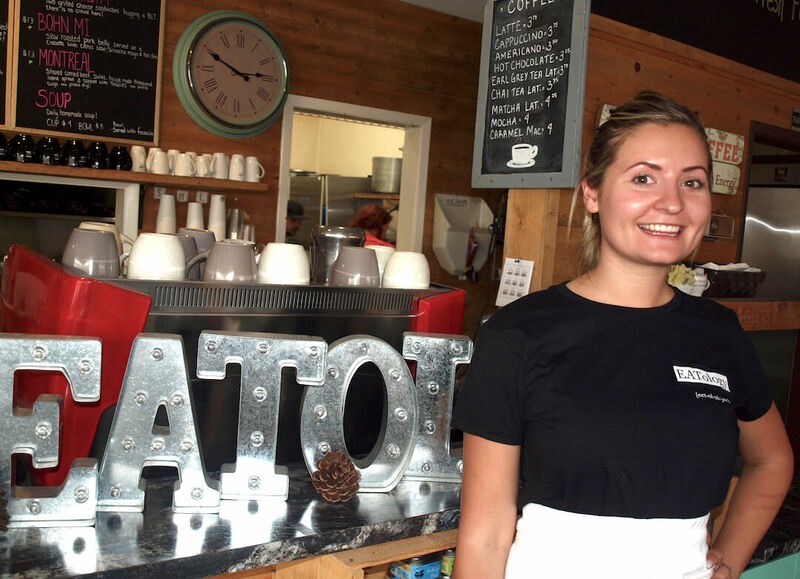 After returning to the Okanagan, she opened a catering company in Vernon when she was just 19. 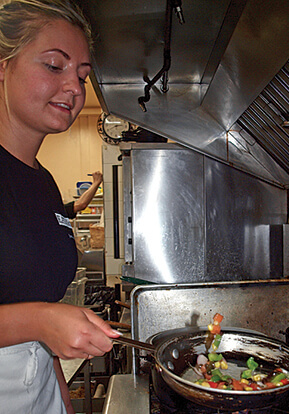 It was successful enough that she needed a commercial kitchen to work out of, and when the bus depot diner came available, she took it, without even considering opening a restaurant there. “I’d never eaten in a bus depot, so I didn’t think anyone else would eat here,” she admits. She put in new kitchen equipment, then decided she should do something with all the space out front. Even if she could find a way to bring in as few as 10 or 15 customers, it would help pay the rent. She renovated and came up with a range of dishes incorporating her favourites, featuring healthy ingredients and some comfort food — all with a bit of a twist. Immediately, sales were three times higher than the previous tenant. 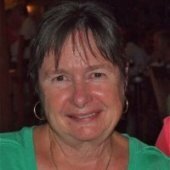 She donated to local community groups, and by word of mouth, people came to try out her offerings: light fare, various versions of eggs benny, hearty food, oven and fried foods, burgers, sandwiches and sweets. She hadn’t been open long when she found she was too busy and had to hire staff. A self-taught chef, Kristina admits she doesn’t follow recipes and says she is always experimenting. She writes down what she does and continues testing until she finds the right combination and — presto — a new recipe. Her sous chefs are encouraged to be creative as well, with specials every day and new dishes always added to the menu. Her favourite dish? 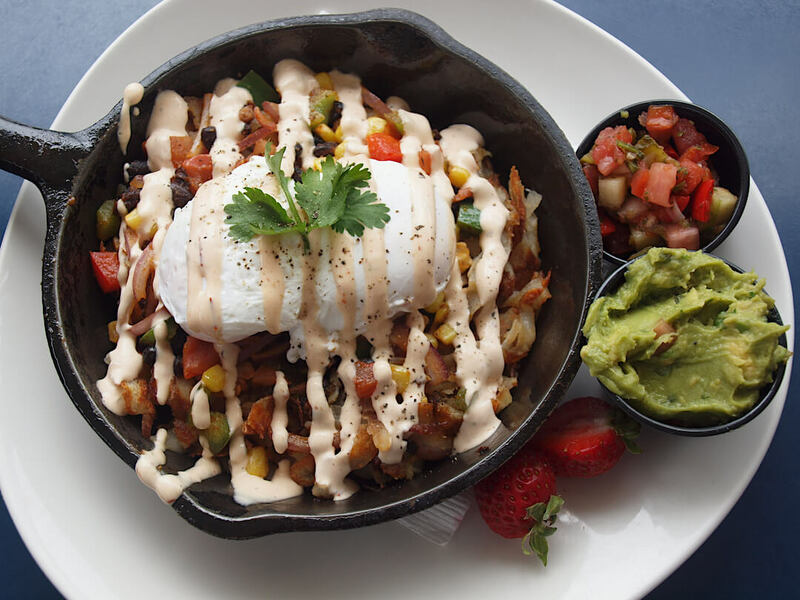 Kristina breakfast go-to is a Mexican skillet with peppers, onions, tomatoes, corn and beans, sautéed and added to hash browns, topped with a couple of poached eggs and a secret drizzle; served with guacamole and salsa on the side. 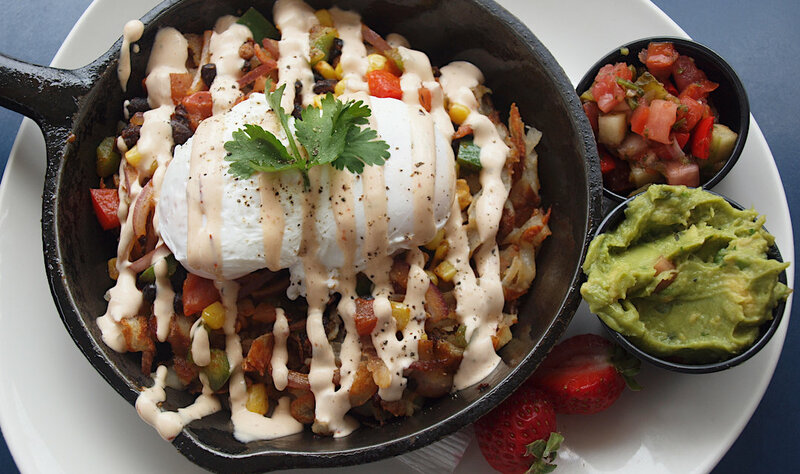 It’s fresh and healthy, and wherever possible, is made with top-quality, local ingredients — like all her creations. Her husband’s favourite is the chicken and waffles, made with meaty bacon, so it’s both sweet and savoury. From a one-person operation, she now has 21 working for her, and she believes it’s essential they all get along. Instead of just working in the kitchen, she floats, so she experiences all facets of the operation and stays familiar with what’s going on. 6 a.m. to closing time at 3 p.m. She tries to keep her prices reasonable so everyone can come and eat.